Setting up your email signature is simple and helps all of us at Viderity put a consistent face forward as we communicate with clients. Just follow the simple steps below to get started. Open the viderity-signature.html file in your browser. Select the signature and copy it to the clipboard (Ctrl+C or ⌘+C). Use the Email Client Instructions below to install the generic signature file into your preferred email client(s). All other information should remain unchanged. Also, don’t change any of the text sizes or fonts. Create a new email message and paste the signature into the body. Open the email in your mobile/tablet device’s email app. Select the entire signature and copy it. Delete any plain text signature you already have for your Viderity account. Paste the signature into the signature box. The original formatting should be restored and your signature is ready to use. For more detailed instructions see this page. To retain the formatting for Outlook on mobile devices like the iPhone, you’ll need to edit the HTML directly to personalize your signature. If you have difficulty with this step, please contact your project supervisor for help. Download the viderity-signature.html file (right click the preceding link to save the file) and open it in a text editor like Notepad. Don’t try and open it in a word processing program like Word or Google Docs because it adds lots of unnecessary formatting to the text. Your email address (line 3) Be sure to update your email address in the href attribute of the <a> link as well. Your Viderity extension (line 4) Contact your project supervisor if you don’t know your extension. Copy the edited HTML code and paste it into the body of a new email. Paste the HTML code into the signature box. Your signature is now ready to use. 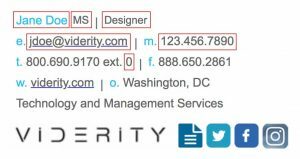 Here’s a detailed overview on how to create and personalize your email signature in Office 365, Outlook 2016, and Outlook 2017. If you’re still using an older version, here’s the guide for Outlook 2010 and 2007.